Calcium is required for healthy bones, teeth and skin, yet few adults obtain enough for their daily diets. Xtra-Cal is one of the most concentrated forms of calcium supplementation available and assists with promoting strong bones and teeth and includes Vitamin D, Magnesium and herbs, for better calcium absorption and utilisation. Provides a concentrated source of calcium to promote strong bones. Includes vitamin D and magnesium for better calcium absorption and utilisation. Can assist in the prevention and treatment of osteoporosis. The most abundant mineral in the body, providing strength for the skeleton and is important in nerves and muscles. Central to energy release and the functioning of the nerves and muscles. It also plays a role in bone structure. 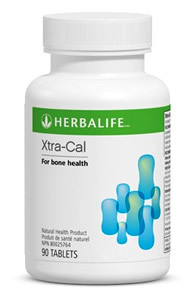 Helps maintain strong and healthy bones by improving the body's ability to absorb calcium. Antioxidant needed for the health of the heart. Antioxidant which helps white blood cells fight infection. Needed for healthy skin. Helps the body absorb iron from non-meat sources. Needed for healthy reproductive and immune systems. Also required for tissue repair and renewal. Component, along with zinc and manganese, of an antioxidant enzyme system. Needed for melanin formation and iron metabolism. Manganese - Component (with zinc and copper) of an antioxidant enzyme system. Needed for healthy bones and nervous system. Glutamic Acid HCL - Excellent forms of Hydrochloric acid - enzymes which assist in the break down and digestion of foods in the stomach (such as fibrous meat).